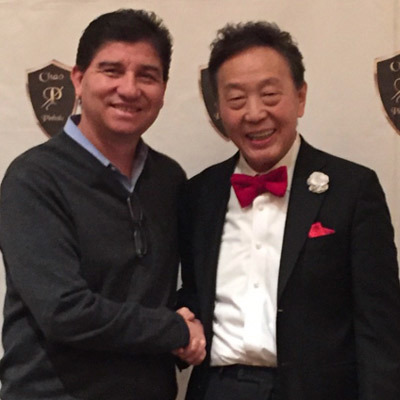 Dr. Trujillo is pleased to have worked with the creator of the Pinhole Surgical Technique, Dr. John Chao. Dr. Trujillo is specially trained in this revolutionary new procedure to treat receding gums. Gum recession is a condition that affects many people’s dental health. It can be caused by periodontal disease, toothbrush abrasion, or simply by the size, shape, and alignment of your teeth. And if it progresses too far, gum recession can lead to decay and even tooth loss. For most people, gum recession is far from inevitable. However, if you notice that your gums are receding, exposing a notch in the tooth, or if you feel extra sensitivity along the gumline, you may be wondering what treatment is available for receding gums. Traditionally, the only technique to replace worn-away gum tissue was a surgery that involved grafted tissue from elsewhere in the mouth. While effective, this procedure is invasive, and can take weeks afterward to heal. Today, however, there is a new, less-invasive way to correct receding gums: the pinhole surgical technique. The Pinhole Surgical Technique is used to treat receding gums through only a single tiny hole. The results are instant and pleasing. If you think you might be a candidate for this procedure, please contact us today. Invented by Dr. John Chao, the pinhole surgical technique is practiced and celebrated by some of the most cutting-edge dentists in the country. Only a small number of professionals are trained to perform this kind of surgery—and Phoenix periodontist Dr. Ariel Trujillo is one of these. Where traditional gum grafts required cutting and sutures, the pinhole surgical technique requires only one tiny hole in your gum tissue. Through this hole, the gum tissue can be gently loosened and repositioned so that it covers the roots of the teeth. The entire surgery takes less than an hour, and it can be performed on several teeth at once. No sutures. The pinhole technique requires no cutting or stitching! And because the procedure is less invasive, it minimizes the risk of infection or other post-operative complications. It also makes cosmetic improvements to your smile instantly! The pinhole itself is miniscule and disappears completely by the day after surgery. No grafts. The pinhole technique only repositions existing gum tissue, so you won’t have an extra cut on your soft palate to create a graft. Minimal discomfort. Patients rarely report pain or discomfort following treatment with the pinhole surgery technique. Quick recovery. You’ll heal much more quickly after undergoing the pinhole surgical technique. Patients can return to their daily activities immediately after treatment, whereas recovery from traditional gum grafting takes a few days. After receding gums are corrected using the pinhole surgical technique, results last a long time and look perfectly natural. Patients overwhelmingly report being highly satisfied with their new smiles. Do you have questions about what the pinhole surgical technique can do for your smile and oral health? Dr. Trujillo of Arizona Periodontal Group is one the few doctors certified to perform this revolutionary surgery. Contact us today for a consultation.